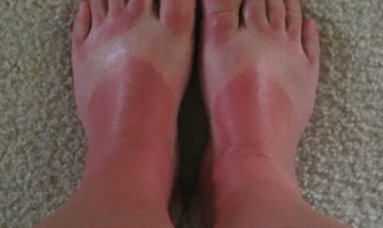 By definition sun burn is red, painful skin that feels hot to the touch and usually appears within a few hours after sun exposure and may take several days or longer to fade. It may include general fatigue and mild dizziness. Typical place for sunburn - your forgotten feet! Brought about from an excess of UV radiation exposure, it can actually be life-threatening in an extreme situation. However, when your exposure to the sun is managed more effectively for you and your skin type, a mild suntanned look can result. Use of sunscreen, especially if a non-toxic and non-chemical version, will assist hugely in preventing both a sun burn and the resultant skin cancers. It is very important to make sure your choice of sunscreen protects you effectively from both UVA and UVB rays. Although the UVB rays are the ones doing the burning of your skin, the UVA rays are doing deeper damage, which you don't get to feel in something as tactile as a sun burn. Besides the above skin cancers, if you do not manage your sun exposure and the result is a sunburn, you will increase your risk of premature aging with dry, wrinkled skin, liver spots, and actinic keratosis. Different areas of your body are more sensitive than others e.g. face and neck are generally more sensitive than your back or your legs. UVB (the burning UV ray) exposure is strongest between 10 and 2, peaking at midday. UVB exposure is much higher in summer. Your skin has the ability to protect itself from the damaging effects of the sun by increasing the production of melanocytes. These cells are created when you expose your skin to the sun and produce the dark brown pigment called melanin in the top layer of our skin - the epidermis. We are all born with a certain amount of melanin, which dictates how light or dark our skin color may be. This extra melanin makes our skin look darker or 'suntanned'. The melanin, or pigment, protects our deeper layers of skin from sun damage. The more melanin we have in our skin, the darker the skin color appears and with this, the more natural protection we have against sun damage. This doesn't mean that people with a dark skin are not susceptible to sunburn and the related sun damage though! 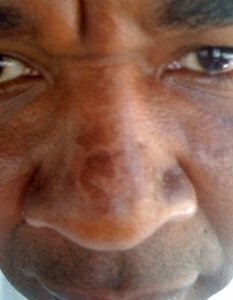 This man has dark skin, but his face still shows signs of sun damage with the irregular pigmentation and peeling on his nose. When I was young I used to get these gi-normous freckles on my nose after long sessions at the beach or swimming pool and I hated them. My mother placated me by calling them sun kisses. Also known as solar lentigines, they are flat spots much darker than freckles and are brown, black or gray. Varying in size, they appear on areas most exposed to the sun - typically the face, hands, arms and upper back. 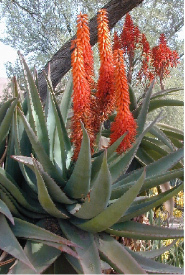 They affect all ages but are common and numerous with repeated sun exposure and with advancing age. These appear on the lips as a dark brown lesion, after repeated sun exposure. Mostly a single spot on the lower lips. Lips are really common areas for a blistering sunburn. Occur after years of sun exposure that causes the skin's connective tissue, the collagen and elastin fibers lying in the deeper layer of skin (dermis), to break down and lose its strength and flexibility. This is seen as vertical creases, deep wrinkles and loose or sagging skin. Typical as part of the aging process, it is way more advanced in some people than others. 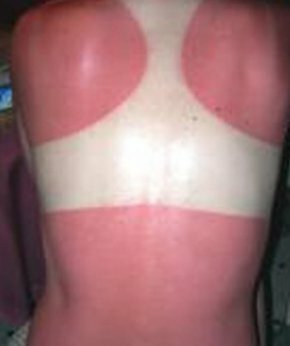 Sunburns logically hasten this process! Sometimes called chloasma or the "mask of pregnancy," it is a brown darkening of facial skin. An increase in estrogen or progesterone during pregnancy or while taking the Pill,or HRT, together with an increase in sunlight exposure are common causes. Not necessarily a result of a sun burn, they usually occur on the cheeks, forehead, nose or chin. A type of melanoma typically developing in areas exposed to the sun regularly, like your face, hands, arms or legs. Starting as a dark flat spot, it slowly darkens and enlarges. Always see your doctor or dermatologist if you notice a new skin growth, a bothersome change in your skin, a change in the appearance or texture of a mole, or a sore that doesn't heal. Cut a leaf off and peel and then and apply the fleshy gel directly to the skin. Thinly slice and place on the burn for about 20 - 30 minutes. Applied to the skin, this will soothe a sunburn. The tannic acid in tea helps remove heat from sunburnt skin. An age old remedy when stinging and itchy. 2 cups of vinegar added to a cool bath allows the acetic acid to dull the sunburn pain, itching, and inflammation. Do NOT exfoliate the peeling skin as your skin is tender enough and needs time to heal. Sunburn can even create a fever, so rest the body and keep cool to allow for best recovery. Don't go into the sun again until the skin is well healed.